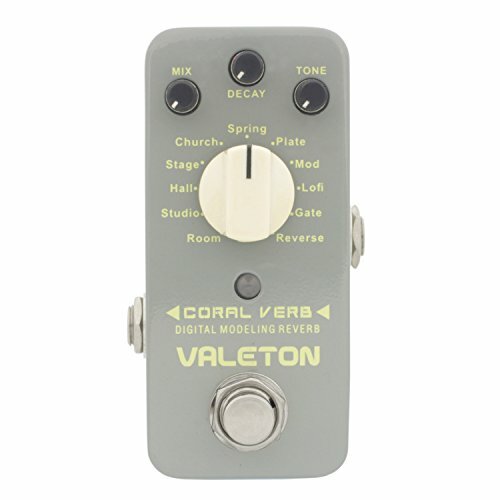 Valeton Coral Verb 11 Types Digital Reverb Guitar Effect Pedal Digital circuit design 11 carefully selected, high quality reverb algorithms in 1 stomp box True Bypass footswitch for crystal-clear signal thru Aluminum-alloy die cast casing to withstand wear and tear Heavy duty metal footswitch and on/off status LED Easy-to-read, readily accessible knobs Reverb settings for every music style Pristine tone with low noise level MIX, DECAY and TONE knobs for detailed reverb control 11 Modes Room: Simulates the acoustics of a room. Studio: Simulates the acoustics of a studio. Hall: Simulates the acoustics of a hall. Stage: Simulates the acoustics of a stage. Church: Simulates the acoustics of a church. Spring: Simulates a spring reverberator. Plate: Simulates a plate reverberator. Mod: Produces a reverb effect with lush, modulated sound. Lo-fi: Produces a reverb effect sample-reduced sound. Gate: Produces a reverb effect with abrupt decay. Reverse: Produces a reverb effect with reversed decay.